Plot - A beautiful adaption of the novel of the same name by Thomas Hardy, Far from the Madding Crowd is a tale of love, honor and betrayal set in the idyllic farming communities of Victorian England. The film chronicles the life and relationships of Bathsheba Everdene, a young beautiful shepherdess with three men that come in her life at different points of time. Toying with their emotions and feeling at first, Bathsheba is burdened with guilt and grief in the later years of her life as she has to deal with unfortunate events and circumstances. 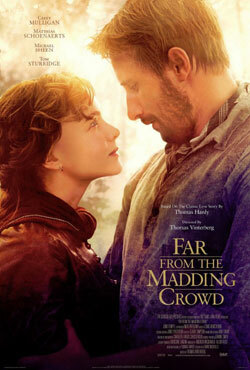 Awards & Nominations Won by "Far from the Madding Crowd Movie"
Box Office Earning of "Far from the Madding Crowd"